A young couple check into a hotel room to begin their honeymoon. Smirking staff stand awkwardly in the room, loitering to deliver ‘silver service’ for an unappetising meal. Cinemagoers’ stomachs will tighten and lurch as the onscreen discomfort becomes plain: neither Flo nor Edward is at ease with the unspoken agenda for their seaside stay. Ponderous silences and unspoken fears allow extensive flashbacks to explore how the pair met, their courtship and the influence of their families on their circumstances. There is little freedom in their new marrital status and the hedonism of the swinging sixties is in stark contrast to Flo and Edward’s comfort zones. The vividness of Flo’s blue dress is at odds with her inner turmoil. While On Chesil Beach’s anxiety-inducing scenes are superbly directed, the film’s storytelling strength is in the manner we learn about the characters’ foibles and watch how they both veer from being loveable twentysomethings to irascible partners with exploding emotions. And we discover the long term effect of a single moment or gesture on the rest of their lives. 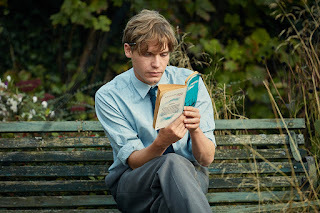 Fans of Ian McEwan – who wrote the original novella and the screenplay – will be heartened by On Chesil Beach’s transformation from paper to screen. 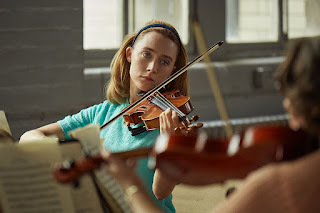 Other than her very heavy violin bowing, Saoirse Ronan delivers an emotional intensity – expressed and suppressed – and excels in her convincing performance of an Oxford graduate who knows her mind yet is haunted by fears – and a hint of past abuse – that rules out any pleasure from even the most innocent gesture of intimacy. It’s another strong performance from Ronan, coming on top of Lady Bird in February. Providing the clash of class, Billy Howle’s portray of Edward combines a bookish and introverted lad whose mother (played by Anne-Marie Duff and deserving of a spin-off movie) has shaped his family life, yet can switch to being rash and angry, losing his charm and (audience) lovability. While Billy’s osculatory technique is somewhat like watching someone chomp at an apple, it’s only a precursor to stronger scenes that serve up revulsion and humiliation. Chesil Beach itself should surely win awards as a location which cinematographer Sean Bobbitt brings it to life, serving up wind, water, beautiful shingle and an innocently phallic shape (on screen if not on the map) stretching out into the sea. The soundtrack of Chuck Berry, jazz and string quartets matches the mood of the story and helps give the final future-looking scene a bit more credibility than it deserves. Director Dominic Cooke could usefully have halted the film fifteen minutes early with the suggestion of regret left lingering rather than any demonstration of contrition. Fans of Ian McEwan and Saoirse Ronan will love the film which showcases their talents. Those just wanting an evening of entertainment will soon be reminded that life isn’t a bed of roses and be drawn into the complexity of the characters and their stubborn journey towards regret. 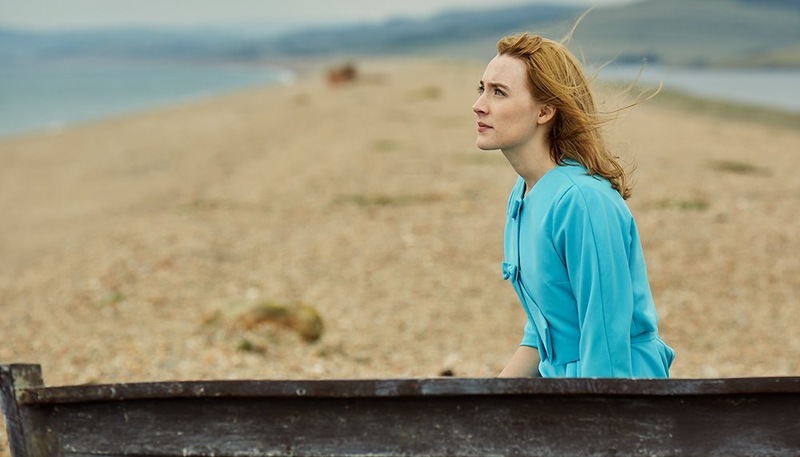 On Chesil Beach is being screened in Queen’s Film Theatre from Friday 25 May until Thursday 7 June.